In December 2014, a group of property owners and registered voters submitted a petition requesting 4,920 acres of their land be annexed into the City of Chattahoochee Hills. 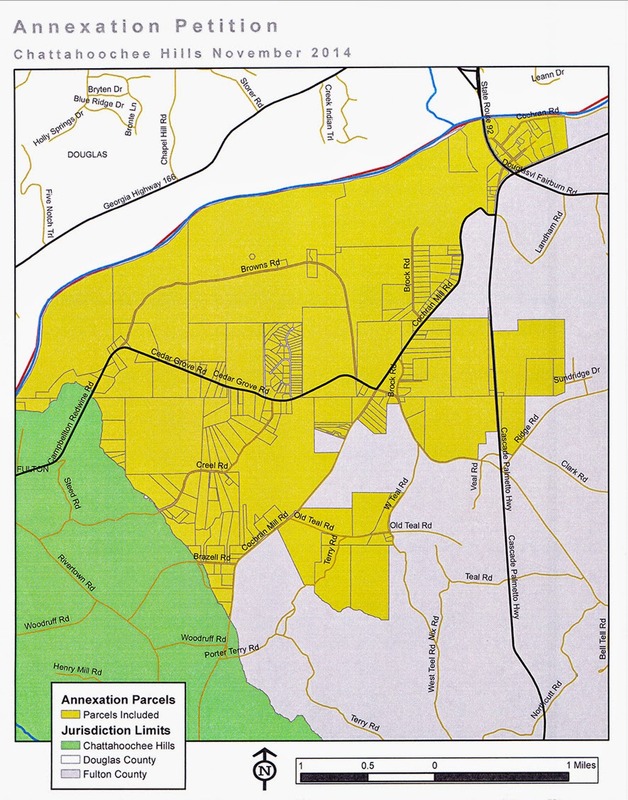 After verifying that the annexation petition complied with state law, the City of Chattahoochee Hills notified Fulton County of their intentions to bring the 4,920 acres within their borders. But instead of following the will of the people and signing off on the annexation, the Fulton County Commission objected to the people-powered petition, creating a land dispute between the county and the city. The Official Code of Georgia Annotated (O.C.G.A.) says that in the event a county opposes a proposed municipal annexation, the entire matter goes before a five-member arbitration panel. Georgia Unfiltered has learned the five-member panel was appointed on 9 January 2014. The following five arbitrators --Patricia "Pat" Graham, former Peachtree City Mayor Don Haddix, Dr. Charles Mitchell of Troy University, Rockdale County Commission Chairman Richard Oden, and Dacula Mayor James "Jimmy" Wilbanks-- will determine if Fulton County's objection to the Chattahoochee Hills annexation is valid, and mediate any differences between the county and the city. The arbitration panel has sixty days to issue a decision. According to the Arbitration Handbook published by the Association of County Commissioners of Georgia (ACCG) and the Georgia Municipal Association, the arbitration panel "is not authorized to approve or deny any particular annexation proposal, but may or may not choose to attach zoning, land use or density conditions to the property in question for one year." Chattahoochee Hills Mayor Tom Reed told Georgia Unfiltered the city will not be changing any of the existing zoning for the 4,920 acres in question; and that he expects the annexation to take place. "We feel comfortable in our position," Reed said.